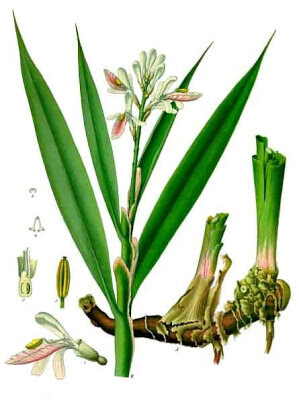 Galangal (Alpinia officinarum or A. galanga) is an ingredient that I associate exclusively with Southeast Asia — Thailand, Indonesia, and Malaysia, in particular. I have pounded it into a Thai curry paste, used it in a Malaysian Nonya Laksa, and stir-fried it with garlic, chilies, lemon grass and mixed vegetables. So it was quite a surprise when I read in Jack Turner’s Spice: The story of a Temptation (which I reviewed back in February 2007) that galangal was popular in Europe during the Middle Ages. It was often part of a spice “gift basket” to give to nobles, as spices from the East carried as much status as flavor or aroma. It was an ingredient in a famous sauce called galantyne (along with bread crumbs, ginger, sugar, claret and vinegar). The great chef Taillevant, who served several French kings in the 14th century, often called for galangal in his book Le Viandier de Taillevent. Galangal eventually fell out of favor in Europe, probably as a part of the nearly wholesale abandonment of heavily spiced food on that continent after the Middle Ages. Galangal has a distinctive aroma and flavor, reminding me of camphor and medicine, not really something you would expect to want in your food. The flavor is piercing and ethereal at the same time. That combination, however, really works in some recipes. In the coconut-cauliflower soup shown below, for example, the sharpness of galangal is an excellent counterpoint to the rich coconut, bright lime leaf and earthy cauliflower. A simple to make Thai soup with a rich coconut milk base, the distinctive flavor of galangal, and the lovely fragrance of makrut lime leaves. In a large pan, combine all of the ingredients except for the chilies, lemon juice and cilantro. Over medium heat, simmer until the cauliflower is al dente. Remove from the heat and add the chilies and lemon juice. Pour into a serving bowl, and garnish with coriander leaves. Variations: add some tofu cubes or diced vegetables (carrots, potato, etc.) in the first step. Illustration of galangal by Franz Eugen Köhler in Köhler’s Medizinal-Pflanzen (1897) via Wikimedia Commons. I’m diggin’ this recipe, but tag! Very nice recipe, and I love the white-on-white effect that I am imagining (tom kha is addictive!). I also have this book, one of my favs.